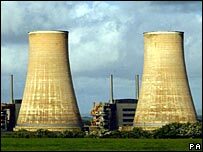 The cost of decommissioning nuclear power sites could rise "significantly" above the £73bn already estimated, an MPs' committee has said. The Public Accounts Committee said the costs for work over the next five years had already risen "steeply". It added that the "uncertainty" over costs far in the future was understandable, but was "difficult to justify" for imminent work. The government said it had warned that short-term estimates would rise. "The Nuclear Decommissioning Authority is already succeeding in providing greater clarity, but we have always acknowledged that the cost estimate would increase in the short term as the NDA gained greater understanding of what it is dealing with," a spokesman from the government's Business Department said. The committee said in its report that the government was unable to provide a complete assurance that the cost of decommissioning new nuclear power stations would not fall to future taxpayers. It called on the government to make sure that operators met future decommissioning costs even before permitting new nuclear power stations to be built. But the Business Department spokesman said that was the government's policy. "As for the building of new nuclear power stations, we've been clear from the very start that energy companies - not taxpayers - must meet the full costs of eventual decommissioning of new nuclear power stations and their full share of waste management and disposal costs." The latest estimate, prepared last year, put the cost of decommissioning at £73bn. Tory Edward Leigh, chairman of the influential committee, said: "We cannot be confident, however, that even this figure will not be significantly upped when the estimates are next revised. "Estimating costs far into the future is of course a precarious business, but elements of cost that might be expected to be more predictable - such as for work expected to be undertaken over the next five years - have risen steeply."